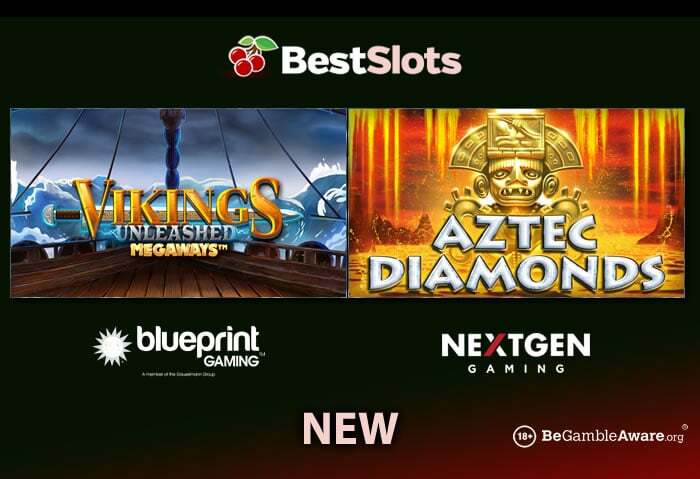 If you like your slot games to come with a big slice of history attached then we’ve got a pair of cracking new releases for you in the form of Aztec Diamonds and Vikings Unleashed MegaWays. Created by GamesLab and NextGen Gaming, Aztec Diamonds is a 5 reel, 30 payline slot game that takes players back to the lost South American civilisation. The design is simple but colourfully done with the reels set against volcanoes and a sea of larva. The game comes with a pair of features. The Jackpot Diamond feature is a streak re-spins round. The diamond symbols from the triggering spin are held and new ones join the cluster if they hit. You’ll get 3 re-spins to start with which are reset every time a diamond arrives. Land a diamond in all 4 corner positions on the reels and they’ll expand to a 6×3 grid then 6×4 and possibly even 8×4 in the Jackpot Diamond Expanding Reels feature. When your re-spins are done, all the diamond symbols flip over to reveal a number. All these are added together and that’s the prize you’ll win. The Free Spin feature awards 6 free spins. Look out here for extra wilds, volcano scatters and diamonds which can trigger the Jackpot Diamond feature – you can also win 3 more free spins. It’s not the most stunningly attractive slot game you’ll play in terms of design but the streak re-spins and free spins with added extras could lead to a torrent of coins if fortune is with you. Read the Aztec Diamonds review for more details. The second new arrival, Vikings Unleashed MegaWays, comes from Blueprint Gaming. It uses Big Time Gaming’s MegaWays game engine where the number of symbols on each reel changes with each spin. If they’re fully expanded, they’ll offer 117,649 ways to win. Look out for the mystery hammer. Whenever these land, they all transform into the same matching symbol with potentially excellent results. Every time you land a winner the successful symbols are removed and new ones drop in and replace them. These cascades keep on coming as long as a new winner is created. They can really come into their own during the Battle of the Seas Free Spins feature. Once triggered, you’ll receive at least 12 free spins which start with a 1x multiplier. You can try and gamble and boost both if you wish. Lose the gamble though and the feature is over. Every cascade win during the feature increases the multiplier by 1x. Get on a roll here and the coins and really shift. Unlimited re-triggers are possible here too. You won’t find many better designed slot games than Vikings Unleashed MegaWays. The cartoon-style visuals are superbly drawn and stirring orchestral score gives the game a real epic quality. Put all that together and you have one of the best releases of the year. Check out the Vikings Unleashed MegaWays for more info. If you want more new releases, head to our Slot Games section where you have titles from Net Entertainment, ELK Studios, Novomatic, Quickspin, Thunderkick, iSoftBet, Playtech, Play ‘N Go and Microgaming.